Original stamped calf with center panel of conventional roses. Arms of first owner on fol. 119: or an inverted chevron gules, with 3 groups of 3 dots gules; owned (1684) by Louis Parizot (signatures on first and last leaves); bought by Richard Bennett, Mar. 24, 1896; his Catalogue, no. 35; purchased by J. Pierpont Morgan (1837-1913) with the Bennett Collection in 1902; J.P. Morgan (1867-1943). Ms. book of hours for use of Chalons-sur-Saôn (Hours of the Virgin? ); perhaps written and illuminated in eastern France, ca. 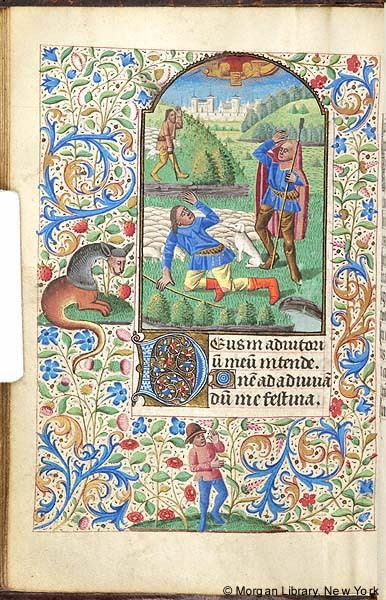 1480. Decoration: 15 large miniatures, 12 calendar illustrations. Artist: illuminated by an artist whose style is related to that of Maître François.